Its -5 Degree celsius. Sun shines throughout the day but you can hardly feel its warmth.It's February and days are longer by an hour in the evening which definitely gives a lot of hope that Winter will pass by . Chilled wind makes it worse ,its then you desperately search for a cosy den. Not just a cosy corner but also comforting food to soothe the bruises of the winter soul. A hearty soup bowl could be a perfect remedy. Nothing fancy was the idea, rather to create something from the locally available supermarket would best save the time. All that boring soup can be elevated to an interesting dish with few magic tricks. check out the magic. This is quite an easy curry, something that can be prepared in no time. You just need some fresh vegetables like few florets of cauliflower, carrot and young french beans. Young peas also goes well in the curry , but addition of too many vegetables somewhat gets overloaded in the curry. Therefore, my suggestion is to keep it simple and plain. This time i baked the famous and most loved German cheese cake. The outcome was super. A super velvet and moist texture . I layered it with mango mousse and the result was just amazing. Now i know why people of Germany are so crazy about the cheese cake. Without a furtherdo, lets get on to the recipe. After long long time i decided to prepare Idli. My friend who is south Indian has been giving me many tips to prepare the fluffiest of all the Idli. I followed her tips and few of my own instinct to achieve the fluffy Idli. The basic idea is to ferment the batter. Fermentation requires a warm temperature and few catalyst enzymes. In this episode i used fenugreek as the catalyst and for warm temperature i warmed a bowl of water in the microwave, took it out and then placed the batter inside and allowed it to rise. In around 8 hours i received the excellent rised batter. This is a quick and very easy chicken curry. It doesn't take much of the ingredients and gets done in no time. Lets take a quick look. This is extremly easy chutney recipe. Gets done in no time. The spring is at its best at the moment, weekdays are mixture of both rainy and sunny days. I am loving the nature Here at Karlsruhe a lot. The blooming greenery all around is inspiring. So, inspired from the nature i thought to prepare a very small kitchen garden for my self. It was last month that i sowed the seeds of Methi(Fenugreek), Dhaniya(Coriander) and Mint. This month i can see them actually growing and budding. The pleasure of growing a plant out of seed is immeasurable. You are always attached with that exciting moment where you wait for the seeds to crack and sprout, then you wait for them to grow into green and finally when they take the shape of the plant you are the happiest in the world. When i was young my mother used to have a lavish kitchen garden. What not was there in , Okra, Eggplant, French beans, Broad beans, Coriander, Mint, Maize, carrots, peas, Spinach, potatoes and Arhar Daal. Infact my mother won many competitions for her best kitchen garden. It was so exciting to gift a bag of garden beans to neighbour, Yes garden can bring you sense of pride and love. It can many times soothe your soul as well. 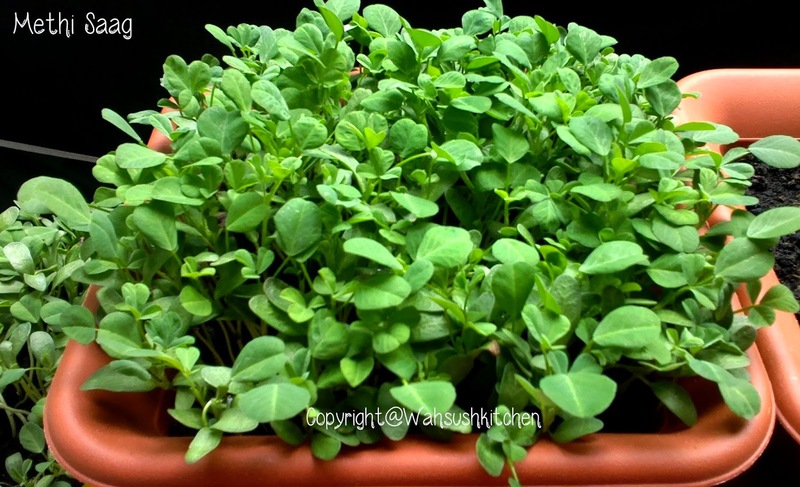 Methi is the fastest growing plant. its easy to sow and as well easy to reap. Soil: Choose the best pot soil for your pot or garden. Methi can be best grown in loamy soil. It also requires a good soil drainage. Choose a sunny place or keep the pot in the sunny area. Preparation: Take the regular methi seeds. Soak them overnight in water. Next day drain the water and place the methi in a cotton towel or in a piece of cotton cloth. keep the cloth moist and place this in a dark place in your house for germination. In one day you can see the sprouts coming up, its now the time to introduce them to the soil. Place the methi seeds in the pot. do not overcrowd the pot. On the top of the seed lay a layer of soil. sprinkle water and wait the shoots to come up in a day or two. Water the pot or the soil everyday. Do not water too much. The basic idea is to keep the soil moist but not soggy. Wait and watch within a week you will see that the methi have grown to a 1 inch plant. Allow them to grow for a month and then start harvesting.